With 50% Indian states ratifying the Bill, GST (Goods & Service Tax) and the President’s nod of approval towards implementation, the government has begun the groundwork for creating a secretariat to cater to the GST Council. This has been constituted for the Constitution Amendment Bill enabling realization of the proposed tax. Given its far-reaching impact on business, an effective and seamless transition to the new GST regime warrants treating it as a ‘Business Transformation’, and not a mere ‘Tax Change’. 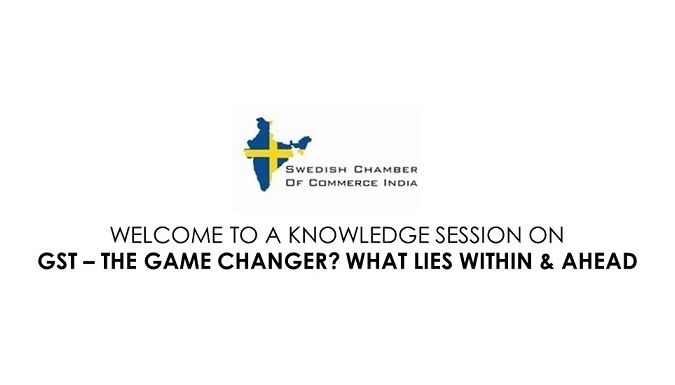 The Swedish Chamber of Commerce India along with Knowledge Partner KPMG, is pleased to invite you to a discussion on GST. Join us for a presentation that will provide insights on the GST Model Law and measures to be taken to be geared for the unified tax regime.